It’s common for hamsters to wee in their wheels, more so if they are not going wee in an toilet tray. What hamster species, and how old? 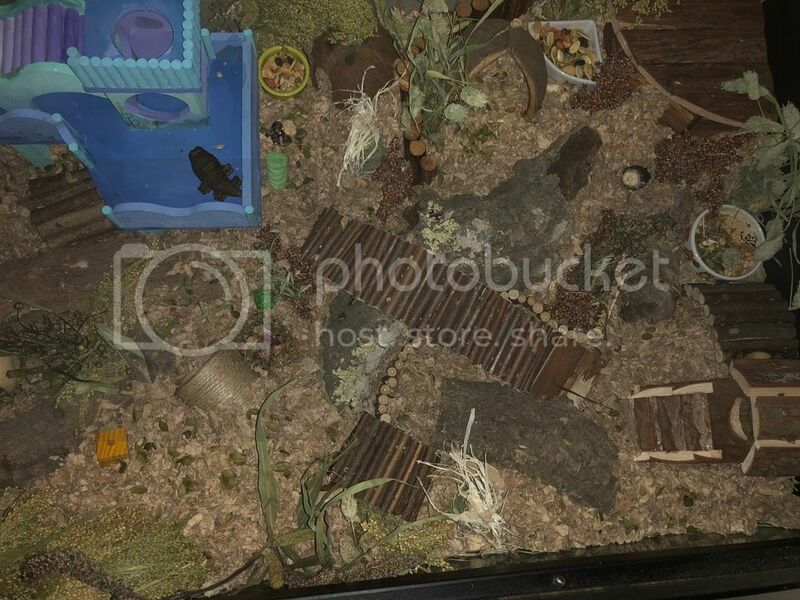 Check hamsters nest, that’s typically where I’ve noticed my hamsters that don’t use an toilet tray wee. Or in an corner of the cage. He was labeled a WW but I'm sure he is a hybrid now that I know more about them. Don't know his age. We have had him for 6 weeks and the pet store person (clueless) said he was 1-3 months old. So somewhere between 2.5 and 4.5 months old. I have dug around a bit in the corners and usually there is just stored food there. He has 3 preferred sleep areas, so I assumed he wouldn't go there. Any suggestions on establishing a toilet tray? Ah, okay. Dwarves typically most often will wee on their wheel. I have 2 dwarves, and an robo currently, my dwarves do not use their toilet tray. It’s not impossible to train them to use toilet trays, although not as easy as Syrians. Once you establish where your furbaby is going wee, place the toilet tray on the spot he’s wee’n, add soiled substrate in the toilet tray. Or can mix substrate with bathing sand, and gradually, transition to all sand, which is easy to scoop out the clumps of wee. 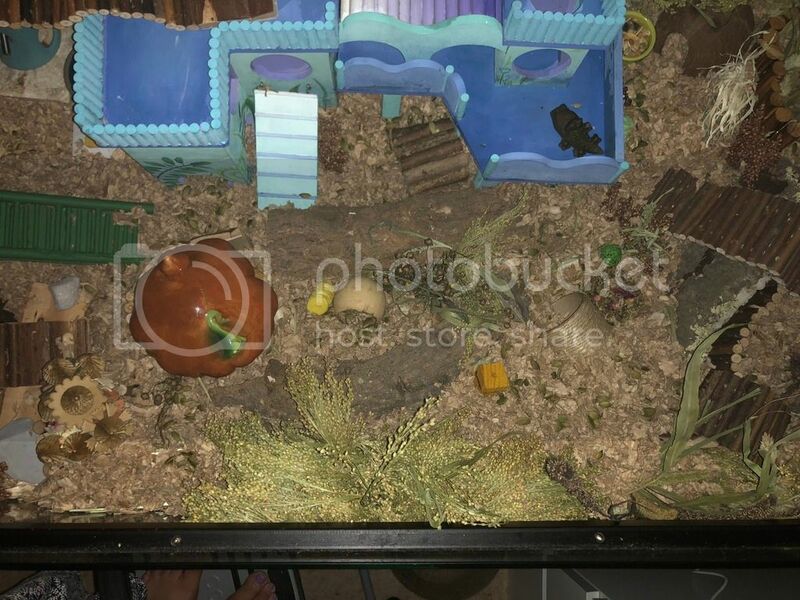 Do you have an sand area for your hamster? Teddy001, not yet. It is on the list of things to get. Sure, let me figure out how to post photos. 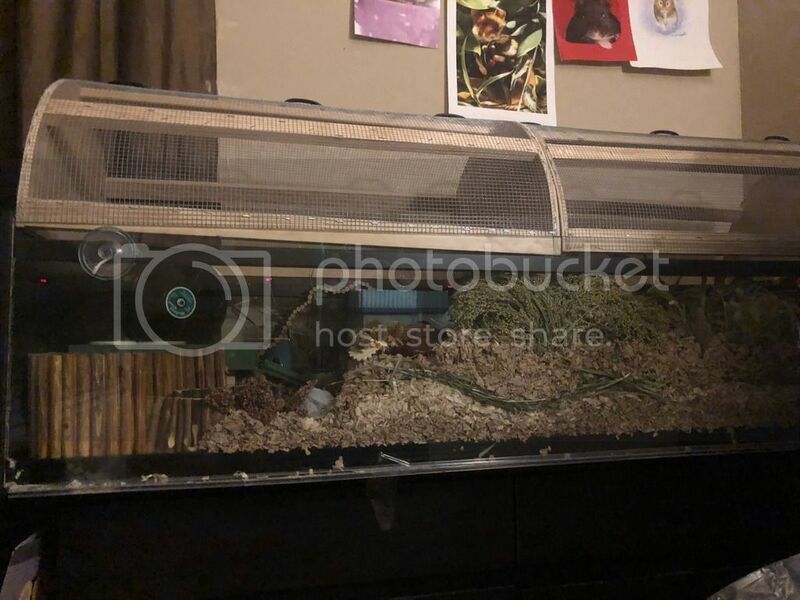 Ace lives in an IKEA Detolf cage, and Gus’s cage is an custom curio cabinet conversion cage, both exceeds 100cm (length). What cage do you have? When your ham wees in the wheel, do you clean it straight away? Hams like to smell their scent, sonetimes if the wheel is over cleaned with cleaning products, it makes them wee on it more. My last ham did it but, all I used was warm water, he would always sniff the wheel when he saw me cleaning it. He only peed in it for a short time. I clean my hamsters wheels, every day or every 2 days.